Champagne is a sparkling wine produced only from grapes grown in the Champagne region of France. The grape-growing area of the appellation encompasses some 34,000 hectares, accounting for 3.4% of France’s total vineyard area. The vines are mainly concentrated around the city of Reims and the town of Epernay in the Marne valley but also extend into the Haute-Marne and Seine-et-Marne. The three primary grapes used in the production of Champagne are Chardonnay, Pinot Noir and Pinot Meunier. Other grape varieties are permitted but rarely used. Methode Champenoise is the traditional method by which Champagne is produced – where, after primary fermentation and bottling a second fermentation occurs in the bottle. 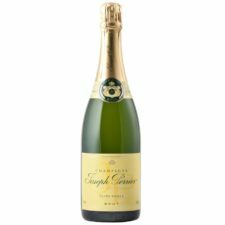 Most Champagnes are non-vintage where a minimum of one and a half years ageing is required. In years where there is an outstanding harvest, Champagne houses may ‘declare’ the vintage using only grapes from that particular year – three years maturation is required for these wines.